How good would it be to have your essential gear in one place, organized and easy to find? Your GPS, handheld VHF radio, waist-pak PFD, rigging knife and marlin spike, multi-tool, flashlight and headlamp, water bottle, sunscreen, navigation rules, boat documents, screwdriver and adjustable wrench… even some snacks and a windbreaker, all right where you need them. Whether it's a day sail, a regatta, a week-long charter or a multi-week passage, this is the bag that will keep your essentials organized and easy to find. 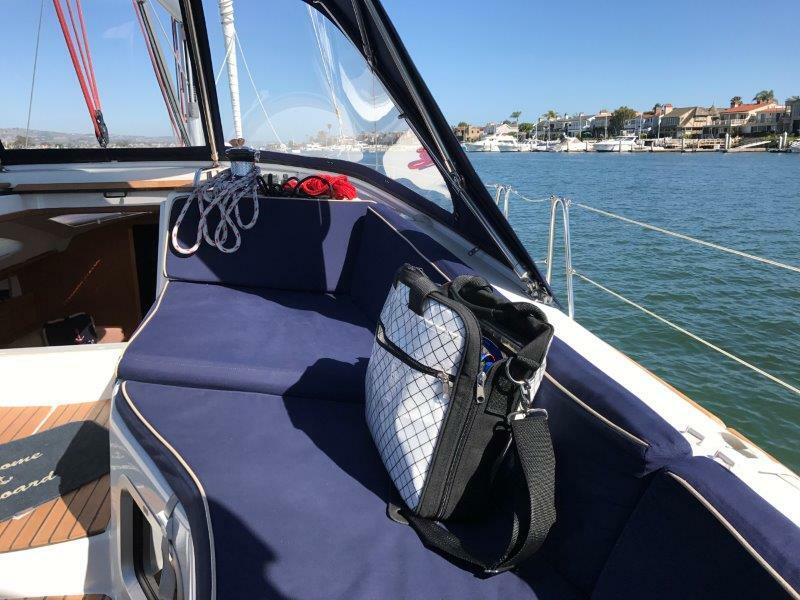 Whether you are out on a weekend regatta, enjoying an afternoon sail, heading out on a multi-day passage or a Caribbean charter, the Santana Mariners Bag is essential for keeping your gear organized and easy to find.. This bag is tough, water resistant, and will last for years and years. Demo gear not included: folders, wallet, iPhone, 3 flashlights, sunscreen, Gerber Suspension multi-tool, screwdriver, rigging knife, marline spike, 6 pens, Sharpie, windbreaker, 2 Clif Bars, sailing gloves, Garmin GPS, Horizon VHF radio, Colregs, Onyx inflatable waist pak PFD. Laminated DIAX sail cloth from Bainbridge and black Cordura trim is what this bag is made of. Along with being water resistant, it's very tough. External and internal zippered compartments, along with drop-in slots for things like tools and flashlights, allow you to put your hands on just what you need, easily. Made in the USA with high quality construction and nickel hardware, the Mariners Bag will stand up to years of abuse. 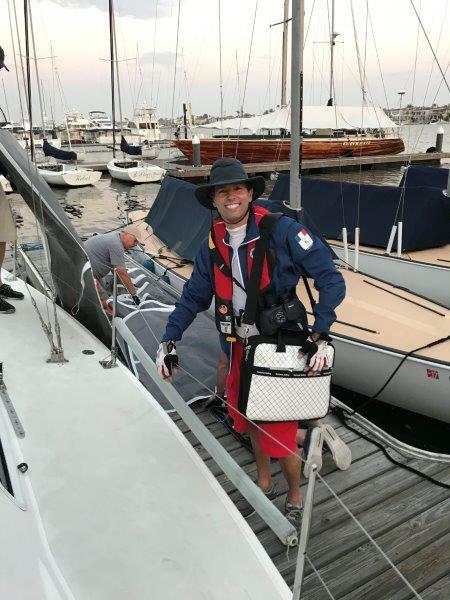 Check out where the Santana Mariners Sail Bag has already been! Why make a sailing bag like this? I had been looking for a bag like this one for a couple of years. My old sailing bag, made of North Sails Vectran Gatorback, was worn out after 15 years of use, and I just couldn’t find one like it on the market. Seriously. I knew what I wanted. I’m a cruising instructor, I run numerous sailing trips, and I’m on the water a couple hundred days a year. I needed my bag to have a place for a few tools, flashlight and headlamp, sunscreen, water, my VHF radio, GPS, a couple of books, teaching aids and a folder or two, and room for a lunch bag and a windbreaker. Oh right, and places for a few pens. My backpack didn't cut it– too many deep pockets where stuff just disappeared at the bottom. An open top "tote" would let my gear spill out. The laptop case made of sailcloth wasn’t anywhere near tough enough. Duffel bags were too big, and the dry-bag styles were just open holes where your gear became a jumbled mess at the bottom. I went to the local North Sails loft to see if they could build me one, and they said that while they could, it would take a while and it would be really expensive. The local Doyle loft said essentially the same thing. I turned to Mickey Parrott, of Parrott Canvas in Greenville, NC, and he said he could do it. I knew right then I had to bring it to market. And so, the reason for all this is that I wanted the best sailing bag that I could get my hands on, and figured that there would be many sailors who would appreciate the same thing. I hope you appreciate your Santana Mariners Bag and enjoy it for years to come. Please send me a note and tell me how you are using it and where it's been so I can add to the blog!